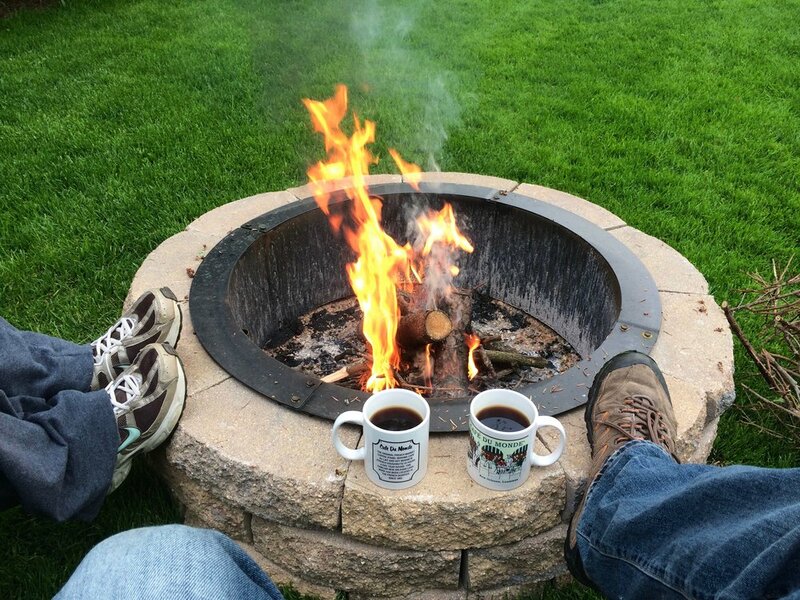 If you are looking to have a firepit at home, there are many options to consider. 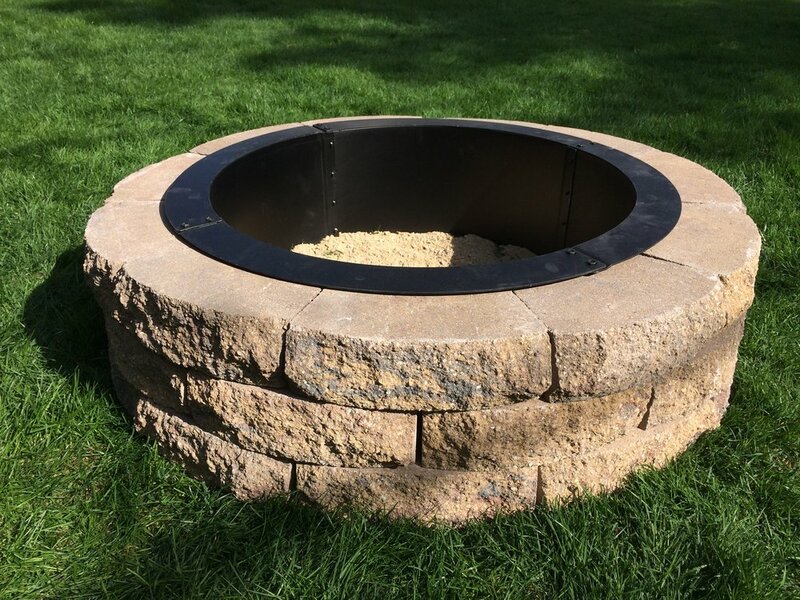 One route is a free-standing metal firepit. The advantages are they they are easy to acquire and also portable, meaning you can move it from the front yard to the back, or even just out of the way when it's time to toss the frisbee. Another route is to have a professional put in a permanent structure with lots of extra landscaping. These setups usually look amazing, but are pricey. While I have a free-standing pit as well, I'm going to show you a simple option that's sort of in the middle that I built in our backyard. Easy, cheap and gives you that awesome "up north" bonfire pit feeling. I bought everything at Menard's and probably spent around $200 at the end of the day. The route I went is with a steel ring on the inside of retaining wall blocks. 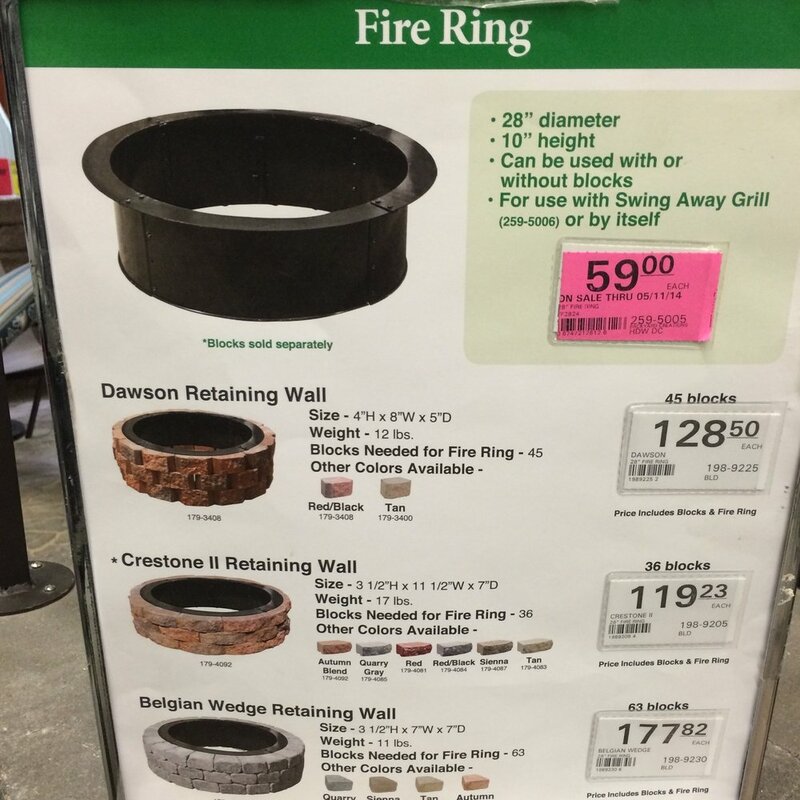 Some people skip the ring, some people use fire blocks in the middle, or others use field stones - totally up to you. I also made sure it wasn't too big! Start placing chairs around a large circle and you will see how much of your yard dissapears. With trees and my firewood pile, I simply didn't have enough space. Some say that you should have gaps or extra holes near the bottom to let in extra oxygen. I find that completely unnesesecary - the fires will burn perfectly with this size pit. Also, any additional air just means your logs will burn up even faster anyways. You don't need to worry about cleaning these pits. The wind will always clear out the fine ash...unless of course you are burning lots of wood every night. Here are the basic steps! 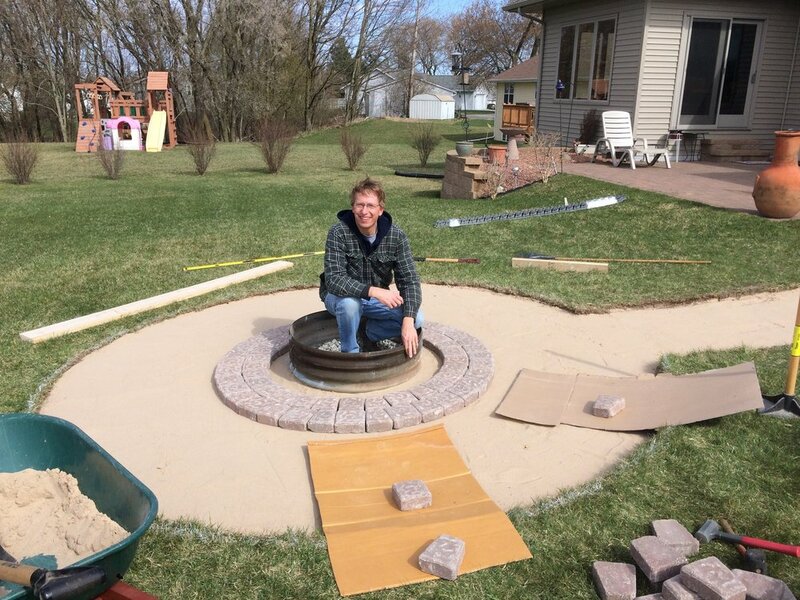 Place ring on ground to mark new spot for firepit. Leave space for the outside bricks and future chairs surrounding the pit. Obviously no one wants to sit super close to hot flames or smoke so ensure the pit has some room. Don't build by anything flamable and follow local regulations. Many places say you should not build within 25 feet of a house or garage for example. Once you have your spot, it's up to you if you want to be a perfectionist or not. Some folks would remove the sod for the bricks and to partially sink them in the ground. In addition, others may pour down sand once the sod is removed to help with leveling of the bricks. If you have level ground and are not as concerned, you can just build on the grass as I did (at the time of this post, my pit is 5 years old and still looking strong!). 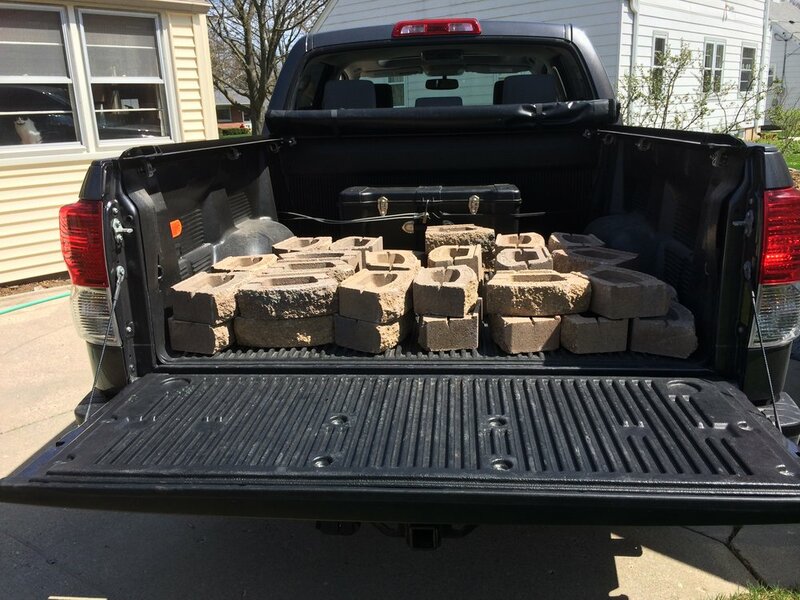 Luckily at the time I had a truck, so hauling the bricks was an easy task. Don't underestimate the weight all of these if you have a smaller car. In the end, I ended up with 36 bricks, which is 3 levels of 12 bricks each. There is a lip on these bricks which needs to be chiseled off. I recommend setting all the bricks on a tarp or a cement patio for this part as rock will be flying everywhere (save your lawnmower!). Put on safety goggles and hit a chisel on the edges with a hammer. It's very easy once you get the hang of it. Each brick will take 2 swings and you are done. After that, surround the ring with your 36 bricks (3 levels of 12) and you are done! Another point I should bring up is that some folks will use a high-temp/outdoor adhesive between all the bricks to hold them together. This is a good idea, but another step that I passed on knowing that the end product would be sturdy enough for my needs. This is something you can always go back and easily remedy if you don't like how it turns out. I dumped sand in the middle. Again, not necessary, but was nice for aesthetic reasons and to help with drainage. Your other option is to just burn the grass out if you didn't already take it out earlier! Due to the shape of the bricks and with the lip on the steel ring, things keep from shifting pretty well. With this design, the bricks will stay cool enough to the touch on the outside so you wouldn't have to worry about grass around the pit dying or catching fire. If you're careful, you can rest your feet as well without melting your shoes. While we are on the topic, if it provides any inspiration, I will post photos below from a similar project my parents did in their backyard which was much more permenant and well done. If I had the space and knew we were staying in out house longer, I would have done something more like this. They glued the firepit bricks together with strong, high-temp adhesive so prevent shifting of the pit itself. They swept in a motar mix between all the pavers on the ground. 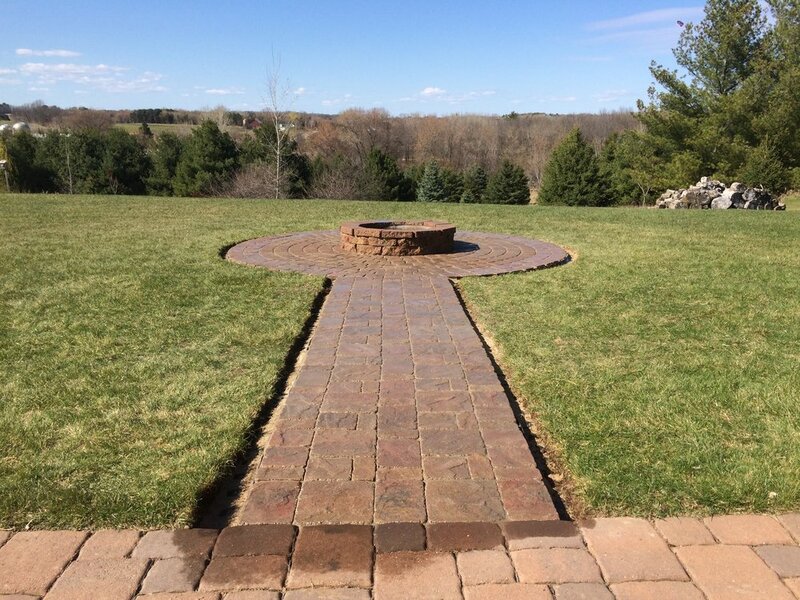 Once complete, it was soaked with a hose to create a tough bond between all the pavers. It's like a tough sidewalk now. 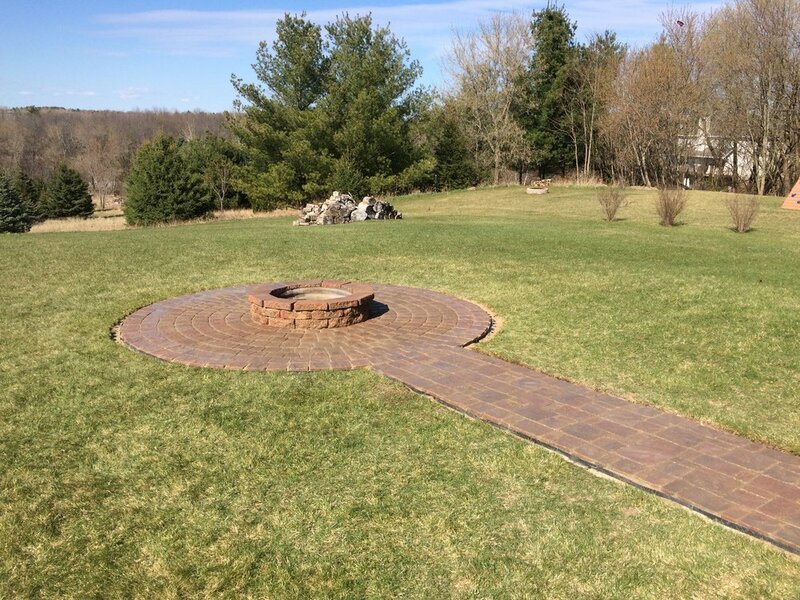 The pavers were part of a "kit" that provided the right amount of bricks/correct shapes to make this perfect circle. 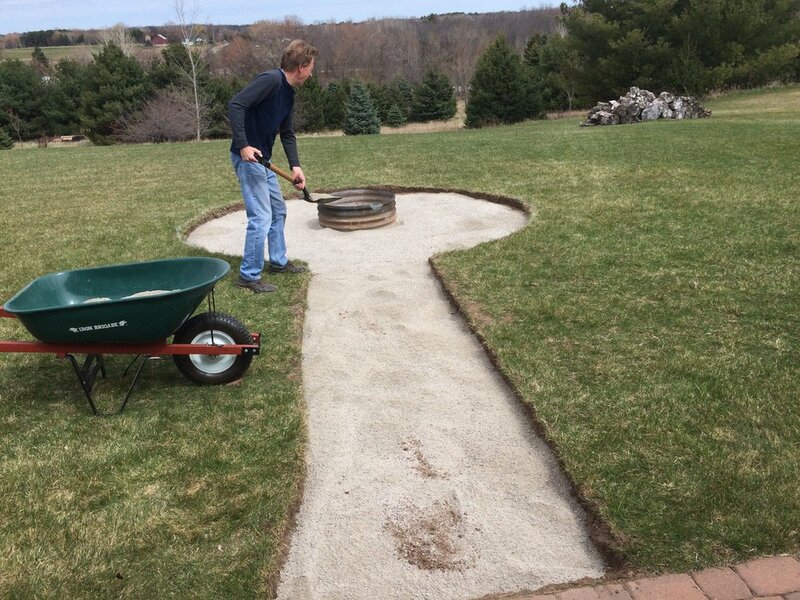 We also pounded stakes into a plastic strip that went around the circle and walkway to secure the bricks even more from shifting/sinking back into the lawn in the decades to come. They expanded the paver circle out enough to fit chairs. 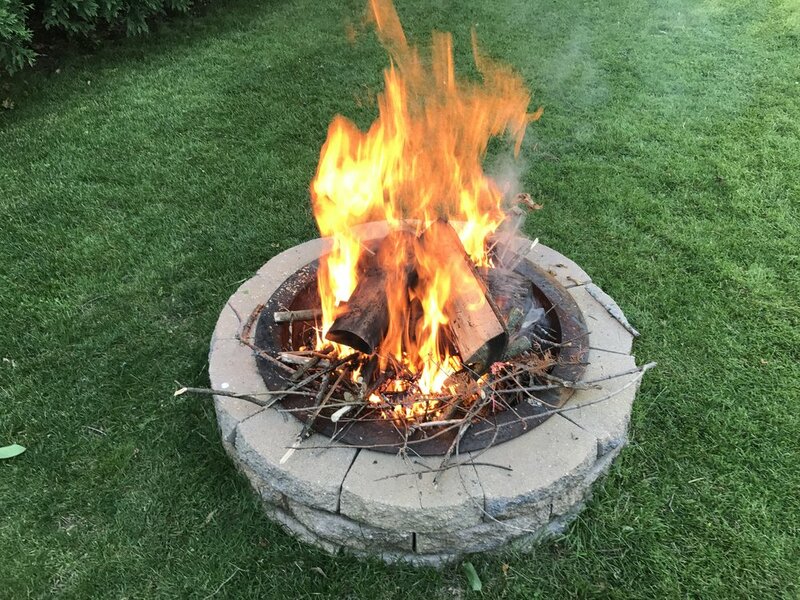 It usually works well, but even they admit they could have made the circle a little bigger so that your rear chair legs don't sink in the grass behind you when you need to be a little further away from the fire. The center of the pit was filled with gravel for drainage and to keep logs off the ground. Overall, an outstandingly well-done project. In the end, a fun and enjoyable project which allows you to spend many more evenings outside to relax and enjoy life! As always, let me know if you are tackling this sort of project and have questions!